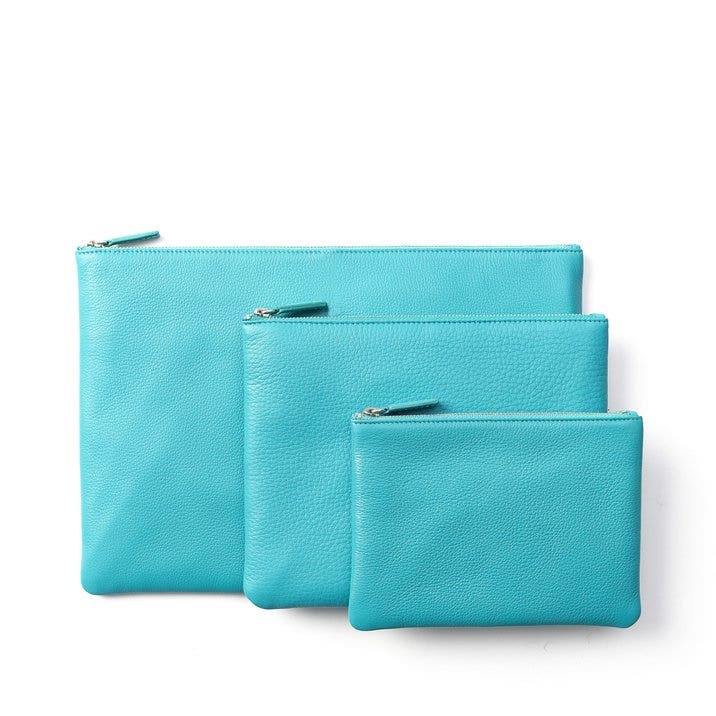 Our Zippered Pouches come with three distinctly-sized leather pouches to keep your essentials contained on the go. Whether you want to store tech essentials, to daily makeup or grooming needs, these travel-friendlypouches will keep all you need at hand. Simply toss them all in your favorite bag or pick your favorite for the day and get going! Very well worth the investment - for years and years worth of enjoyable use. These are beautifully made and beautifully packaged! Product was even nicer than expected. Process was very easy from start to finish. Packaging is above and beyond. Definitely not cheap but very happy with the purchase. My wife loves them. I bought a set of these in cobalt for myself and in stone grey for my mother. We have very different tastes (I work in fashion and she's a doctor) but we both love and use these pouches regularly. The large pouch is pretty big - you probably can't fit an iPad pro, but you can fit almost anything else in there. We both use the medium pouch for makeup, and the small pouch is great for tech cords and other small essentials. I love these three pouches, they are made of butter soft leather and among the three of them, there is a size for everything. The large pouch is just shy of fitting my 13" laptop but it fits my iPad and Kindle nicely.